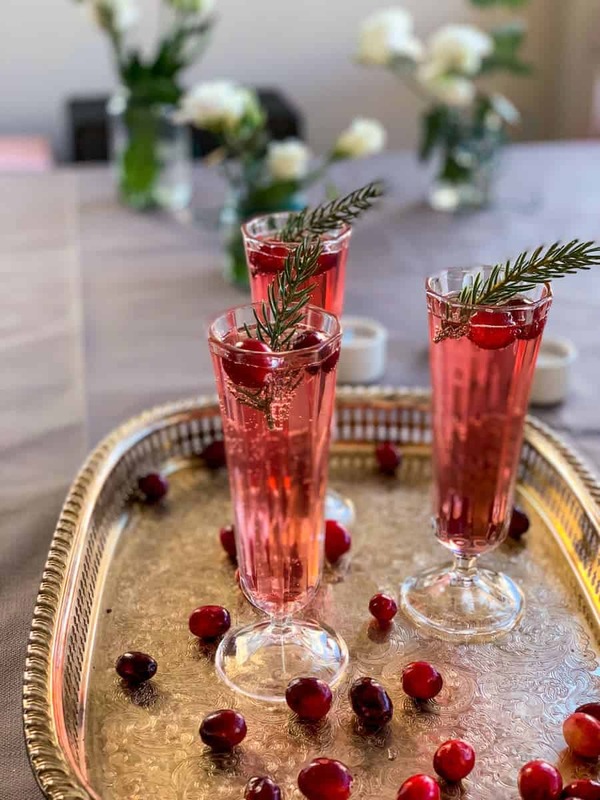 A Cranberry Champagne Cocktail is the perfect holiday cocktail – luxuriously sparkling, just the right amount of sweet and with a nice kick from the gin. Oh, and what about that beautiful color?? A Champagne cocktail not really doing it for you? If spicy wine‘s what you’re after – check out this Christmas Sangria. Or is bittersweet more your type of flavor? The Clementine Campari Cocktail has loads of that! If non-alcoholic is what want, there really isn’t anything better than the Sober Santa Christmas Punch. 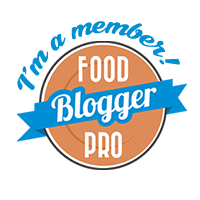 Today is a big day here on always use butter! Can you guess why? Well it’s the first ever always use butter cocktail recipe! 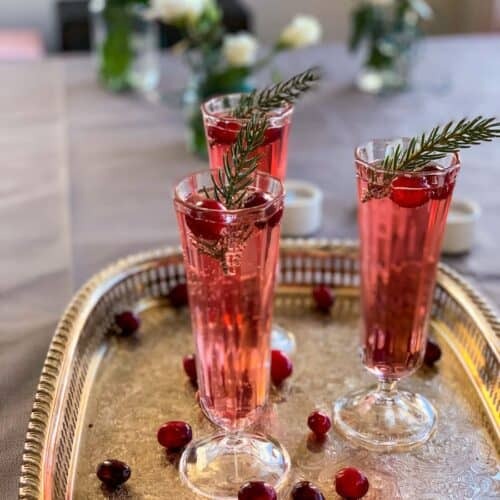 It’s also the first of four holiday cocktail recipes I’ll be sharing with you before Christmas, one very Friday – can’t have you drinking the same cocktail all through December, now can we?! Have you had a classic Champagne Cocktail? With Angostura bitter, cognac and champagne? Well, this doesn’t taste at all like that but the classic Champagne Cocktail was actually a big inspiration. It’s one of my all-time favorite cocktails, but it feels really Christmas-y to me so I only really have it once or twice a year, around the Holidays. It’s superstrong as well so maybe that’s a good thing. When I started planning what holiday cocktails to create, I knew I wanted at least one of them to be a champagne cocktail. I mean, is there anything more festive? Not really, right? And while the classic champagne cocktail is almost too boozy I do enjoy the thought of a slightly “topped up” champagne. A little more booze, you know. But don’t worry, it’s evened out by a generous amount of cranberry juice. I actually made this cocktail for my friends over Thanksgiving, and they all asked for refills (and were surprised I’d come up with the recipe myself – should I be insulted??). So yeah, if you’re anything like my friends, I think you’ll enjoy it. Less, talk – more making cocktails! Making this one is super easy! You need three things: cranberry juice (preferably not too sweet), gin, and champagne. Now if you don’t want to splurge on the real deal Champagne you can go for Cava, Prosecco or another sparkling wine as well. While I’m usually an as-dry-as-possible kinda gal when it comes to anything bubbly I’ve made this with a Prosecco (which is by default a bit sweeter) and that was a great match. 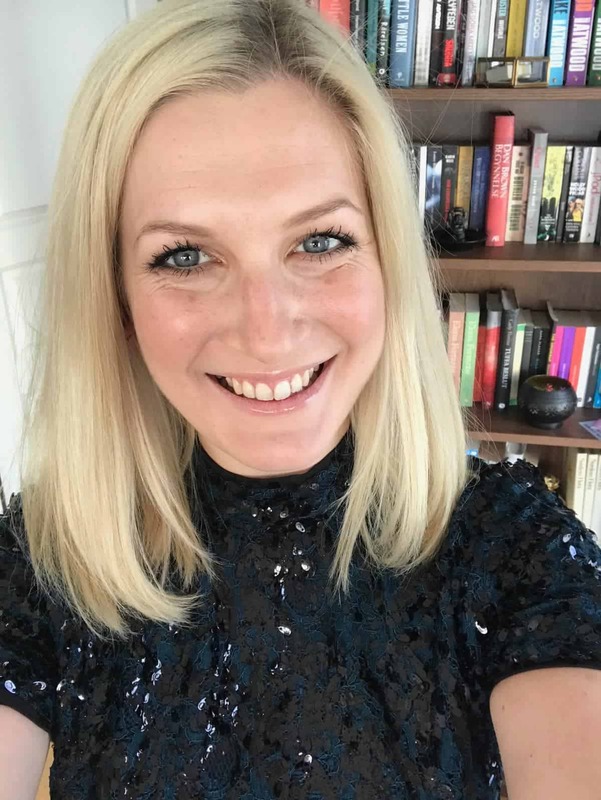 It’s up to you – if you prefer it a bit sweeter, use Prosecco or a semi-dry sparkling wine, if you like it less sweet, go for dry. Or just use whatever you have! No need to bring out the fancy gin either – too much other flavors for anyone to notice if you’ve been cheap. Anyway. 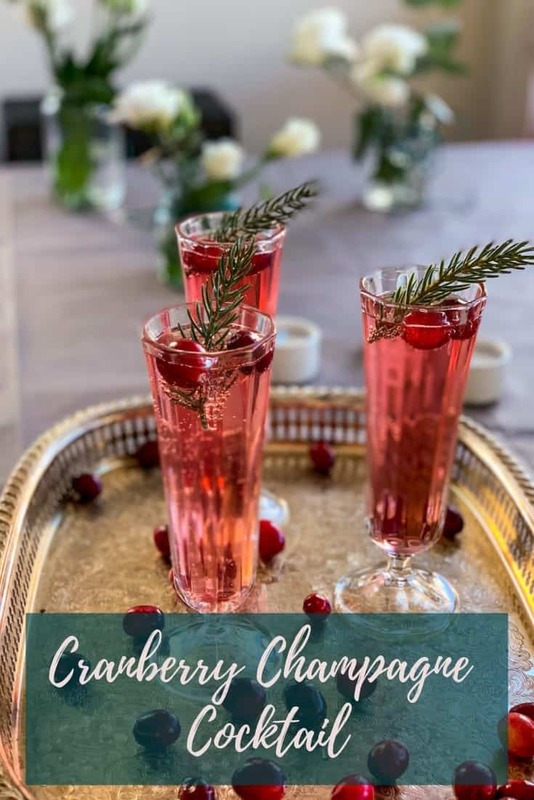 Pour about 2 cl (3/4 oz) of gin in each glass, fill up halfway with cranberry juice and then fill up the rest with champagne. That’s it. So easy! Oh you can also add some decor if you like. 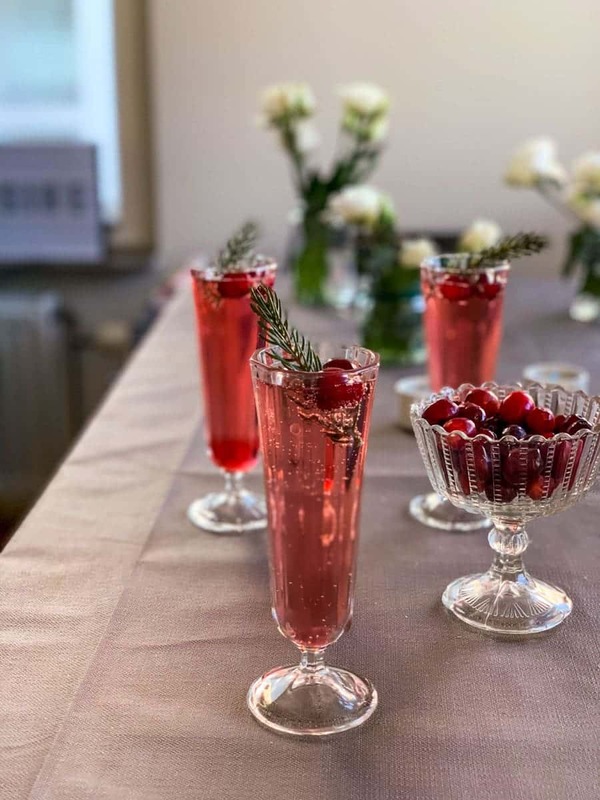 I dropped a few fresh cranberries in each glass and stuck in a fir twig – use what you have! So, dear readers, what do you think of this? Do you like cocktail recipes? Should I do Friday cocktails all through December, or is this one enough? Please let me know in the comments below! 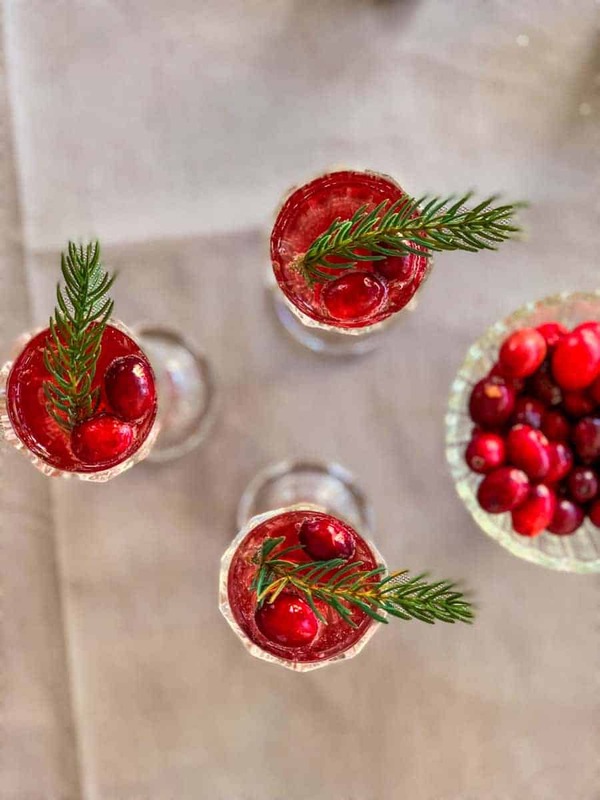 Have you tried any of these Holiday Cocktail recipes? I’d love to know! Leave a comment and/or rating below, and please tag me if you post your creation on Instagram, and use the hashtag #alwaysusebutter. 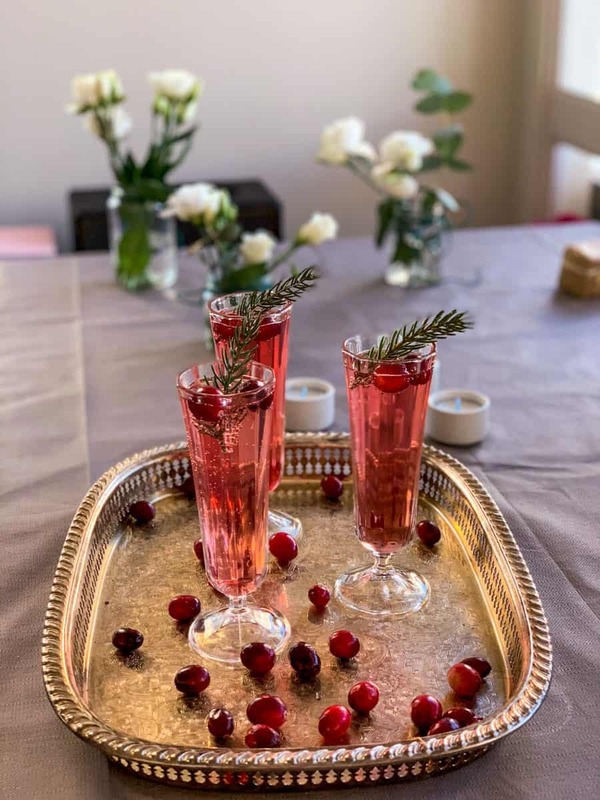 Pour the gin into a champagne flute and fill up halfway with cranberry juice. Fill the rest of the way with chamapgne. Top with fresh cranberries and fir twigs (can be omitted). Easy on the alcohol? Skip the gin and add some juniper berries if you still want that forest-y flavor. Hold the alcohol? Skip the gin, add juniper berries (if you like the forest flavor) and use non-alcoholic sparkling wine in place of the champagne.